The Le Cellier Steakhouse is located below the Chateau at the Canada Pavilion. Its designed to resemble a wine cellar. You'll find bottles of various vintages displayed behind wood and glass showcases. Literally translating to "the cellar", there are no windows in this underground restaurant. Ambient lighting creates an intimate setting. 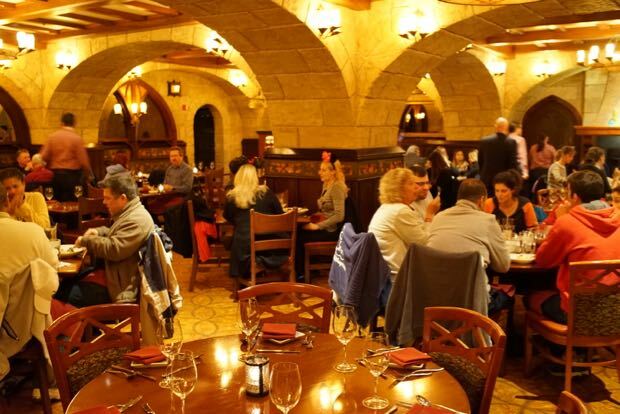 Stone arches add to the authentic feel of dining in an underground treasure trove of fine wines. The signature dish is the Canadian Cheddar Cheese Soup. Accompanied by the delicious assortment of breadsticks that are brought to your table, it's the perfect start to a memorable meal. While steak is the focus, the menu is varied. This location requires 2 table service credits on the Disney Dining Plan for both lunch and dinner. Menu discrepancies or corrections about Le Cellier Steakhouse? Let us know!